You are here: Configuration > Integrated Scanning > Integrated Scanning overview > What is Integrated Scanning? Integrated ScanningIntegrated Scanning provides a secure, consistent, and easy way for users to scan documents to: their own email address, their own home folders, or other authorized email and folder destinations. 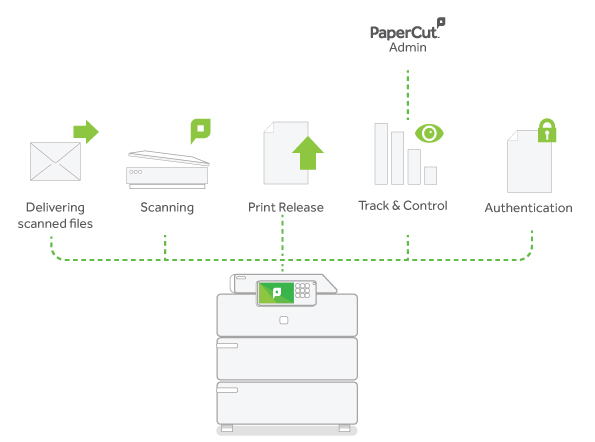 is PaperCut MF's scan control application. It's embedded on Multifunction Devices (MFDs) to provide secure Integrated Scanning as a simple, one-touch experience. Integrated Scanning not only provides the most common scan job settings through a consistent interface across most MFD brands, it also lets you easily control, track, and report on all users' scan actions on your devices. 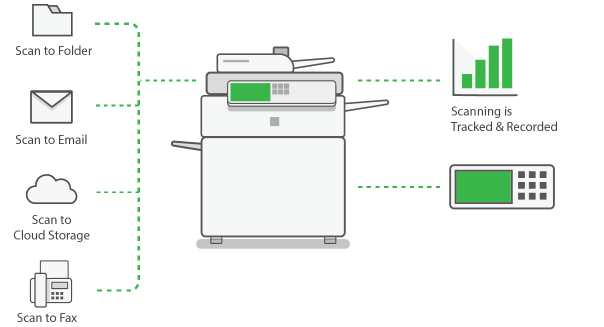 Scan actions are preset scan settings that control a scan's output (file type, DPI, duplex, text searchable etc.) and delivery location (email, folder, cloud). Scan actions make the scanning process simple and fast for your users. You can set up any number of scan actions using the PaperCut MF Admin web interface. And you can control (at the user or group level) who has access to each scan action. Scan actions take minutes to configure, and once set up they're automatically available across all of your MFDs. This ensures that all users who have access to the scan action have a consistent scanning experience no matter where they are located or which device they are using. They simply select a scan action to quickly and easily perform a scan job and charge it to an account. Send a scanned document to the user's primary email or a predefined email address. For example, you might want to share a scanned document with someone in your organization who is in a different location and therefore can't access a secure folder. Send a scanned document to either the user’s home folder/personal directory or a predefined network path. For example, send the scan directly to a folder in a document management system. Send a scanned document to a location in the cloud storage provider of your choice, via the hosting region of your choice. Users can set up their own account within the storage provider. This is a one-click storage solution that includes authentication management for most cloud storage providers. Other advantages are automatic back up (no local backup required) and access to scans from anywhere. Scan to Cloud Storage is one of the PaperCut MF Cloud Services. One of the great things about Integrated Scanning is that you can choose to create text-searchable and editable documents using Optical Character Recognition (OCR). Importantly, you can choose where the OCR processing is performed; either on your premises using your own infrastructure or in the cloud using PaperCut MF Cloud Services. The option you use will depend on your organization's data policies and system capabilities. PaperCut MF Cloud Services is available with active Maintenance & Support (M&S). The first time you create a Scan to Cloud Storage scan action or any scan action that uses the PaperCut Cloud OCR service, you will be prompted to activate PaperCut Cloud Services, which checks that you have active M&S. To see how Integrated Scanning works at the MFD, take a look at Integrated Scanning at the MFD. To set up scan actions, go to Configure Integrated Scanning. You might also want to check out Example Integrated Scanning implementations.